Twenty years ago, workers ground one of the world's largest corporations to a halt. And workers in the logistics industry could do it again today. Twenty years ago, the Teamsters’ national strike against United Parcel Service (UPS) produced panic, if not outright hysteria, in the corporate boardrooms of the United States. 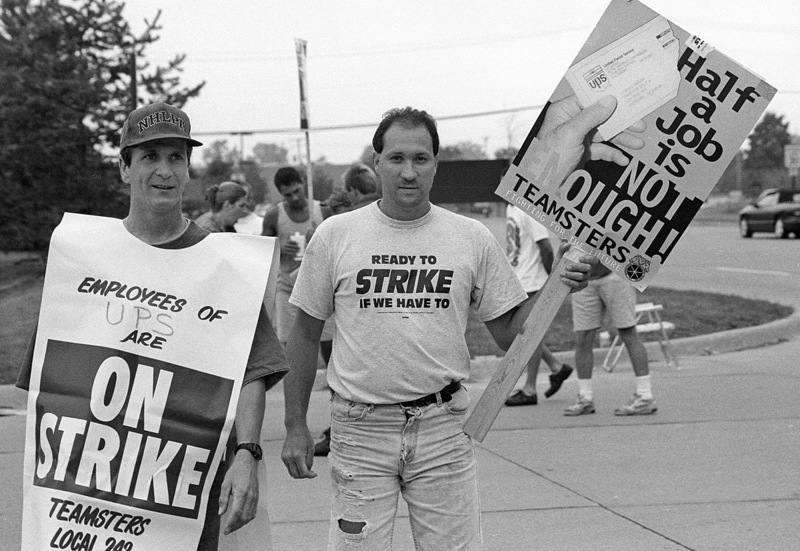 With 185,000 Teamsters on strike for nearly three weeks beginning on August 4, 1997, fighting under the slogan of “Part-Time America Won’t Work,” the UPS strike proved to be the most popular strike in a generation. Now that the US and world economy revolves around the burgeoning logistics industry — dominated by giant corporations like UPS, FedEx, Walmart, and the quickly growing Amazon — we should look back to the 1997 UPS strike for lessons on how to revive a dying labor movement, and how to hit capital where it hurts. The “member-to-member” campaign was certainly the largest initiative ever in the union — if not the entire US labor movement — to involve 185,000 rank-and-file union members in a contract campaign. In February 1997, the ITF held a meeting of all unions that represented or aspired to organize UPS workers in their respective countries around the world. They met to form the World Council of UPS Trade Unions in London. Plans for a global day of action in support of US Teamsters were formulated. Packages piled up in enormous mounds everywhere. UPS never actually believed there was going to be a strike and left its customers hanging. It had no Plan B. The other big shipping companies including the US Post Office, Airborne, DHL, Emery, and FedEx couldn’t handle the increased volume of work. The Post Office, the first option for many UPS customers, groaned under the crushing weight of hundreds of thousands of new packages that flooded into its system. The rally felt like being at a revival — a revival for the entire, long-beleaguered US labor movement. But the UPS strike should not be confined to history. At the time, it felt like the strike of the future. And it still is. Today, the US and world economy is organized around the sprawling logistics industry like UPS. Logistics giants — almost entirely non-union — such as FedEx, Walmart, and Amazon are as visible in daily life as UPS was in 1997.